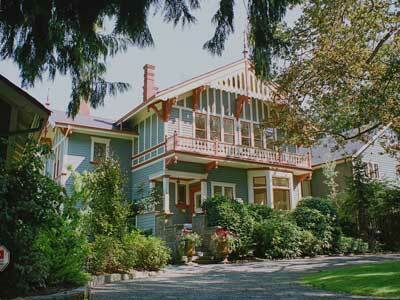 Inglehurst is an excellent example of the Swiss Chalet style, rare in Victoria. This two-storey, cross-gabled house shows typical features: low-pitched, front-gabled roof, wide, bracketed eaves and flat sawn trusses in the gables. Also typical are the full-width, upper-storey, cantilevered balcony with flat sawn balustrades, and decorative vertical stickwork applied over drop siding. Atypical features are the bays on the front and right side. On the right side of the house is a one-storey, hip-roofed, cantilevered box bay and, to its left, a full-height, gabled box bay interrupted by a brick wall chimney with shoulders. On the left side of the house is a large gabled extension towards the rear, which is shingled on the upper floor. Also atypical is the inset left corner entry porch with square chamfered post and pilasters. The stair balustrades are of stepped stone. There are a number of stained glass windows. It was built for $3,000, and duplexed in 1950 for $3,000. The decorative details on the house, missing for years, were replicated by Vintage Woodworks for Colony Construction in 1988. In subsequent years Maclure modified the chalet style in a series of houses resulting in a house-type referred to as the “Maclure Chalet.” Among them are 1009 Terrace Av (1899-1900) and 1598 Rockland Av (1904). 1896-1925: Mary Ann “Penelope” Attwood (née Clifton, b.Nottingham, ENG 1833-1925) was the daughter of the Rev. William C.B. Clifton, and granddaughter of Sir Granville Jukes Clifton. She married Francis William Attwood in 1861 and arrived in Victoria in 1862. After his death she remarried in 1873, to cabinetmaker Thomas Sidney Wilson (b.Yorkshire, ENG 1824-1906) who came to Canada in 1862. He was employed by the E&N Railway. Penelope remained in this house until her death. She was one of the first organists of Christ Church Cathedral, and a noted soprano and teacher. 1928-31: Capt. Roy Wayne Troup (1881-1954), son of BC Coastal Steamship Co (BCCSS) superintendent Capt. James Troup (396-468 Belleville St, James Bay). In 1906 in Seattle, he married Maude Goodwin, an accomplished musician. Roy followed in his father’s footsteps, serving sternwheelers on the Skeena for several years and later ran the White Swan Flyer on the Fraser. Roy commissioned construction of the sternwheeler SS Craigflower in 1908; it was intended to be used in Victoria’s harbour, but after an ill-fated attempt to navigate the Skeena River in 1910 the ship was returned to Victoria and dismantled the following year. During WWI he served overseas with the merchant navy. He died in Los Angeles in 1954. 1932-36, 1941-52: Barrister Alexander Nairn Robertson (1896-1967) and Elizabeth Allan (née Schofield) married in Victoria in 1927. Alexander attended the Royal Military College in Kingston, ON, and served with the Royal Canadian Horse Artillery during WWI. He practised law in Victoria and Vancouver until c.1943. Tenant: 1939: Vera Frances St. Thomas Easton (1884-1985) never married. From 1942-85 she lived at 851 Wollaston St, the only Francis Mawson Rattenburydesigned house in Esquimalt.